Despite well established national and local policies championing the need to provide dignity in care for older people, there continues to be a wealth of empirical evidence documenting how we are failing to deliver this. While we have evidence as to what older people and their relatives understand by the term ‘dignified care’ we have less insight into the perspectives of staff regarding their understanding of this key policy objective. This paper aimed to explore the meaning of dignified care from the perspective of health and social care professionals’ working with older people. In-depth interviews and focus groups with health and social care professionals were carried out across four NHS Trusts in England, as part of a larger study, to investigate how dignified care for older people is understood and delivered. A total of 48 health professionals took part in in-depth interviews and 33 health and social care professionals participated in one of eight focus groups. Health and social care professionals defined the meaning of dignified care as: ‘dignity is the backbone of care’, ‘it’s the “little things”’, ‘feeling safe and secure’, ‘treat as you want to be treated’, ‘treat as an individual’ and ‘Dignity encompasses multiple factors’. ‘Hands on’ aspects of care were rarely mentioned when defining dignity. This suggests that policies around providing dignified care are being interpreted as an approach towards care and not with direct care provision. This limited interpretation of dignity may be one factor contributing to the continued neglect of older people in acute settings. These findings highlight that proactive measures are required to ensure that both relational and ‘hands on’ aspects of care are met for all older people receiving care in NHS trusts. The care that older people receive has been the focus of intense public concern across the United Kingdom (UK) over recent years. There is a growing body of evidence suggesting that dignified care of older people being cared for is still compromised [1–13]. In February 2013 Robert Francis, Inquiry Chairman, released a report into the serious failings at the Mid Staffordshire NHS Foundation Trust, which included numerous instances of appalling care of older patients . The report highlights that between 2005 and 2008 the Trust failed to tackle a dangerous negative culture involving an acceptance of poor standards and a disengagement from managerial and leadership responsibilities. Scandals such as the Mid Staffordshire report unfortunately are not uncommon. The Parliamentary and Health Service Ombudsman report , for example, details 10 cases of older patients who died after being admitted to NHS hospitals but who did not receive the most basic standards of care such that they were left without food or water, were soaked in urine or lying in faeces and left on the floor after falling. The NHS Operating framework for 2012–2013  prioritises the care of older people stating ‘some parts of the NHS are failing to provide elderly and vulnerable patients with dignified and compassionate care or to offer good standards in areas such as nutrition, continence and communication’ (p.2). While we know much about dignity, it remains a complex concept, subject to a range of different interpretations . A philosophical model of dignity and its relevance to older people has been advanced by Nordenfelt  and his comprehensive analysis divides dignity into four types including: merit, moral status, personal identity, and universal human dignity (referred to by the German word Menschenwürde). The first three types of dignity (merit, moral status and personal identity) are subjective and depend upon external influences. Dignity of merit refers to an individual’s role and status in society in which others recognise and respect the person for his or her accomplishments or position. Dignity of moral stature refers to a sense of self respect based on a personal sense of integrity in living one’s life. Dignity of identity is of the most relevance to discussion of dignity and ageing. This kind of dignity can be taken away from individuals by external events, by the acts of other people as well as by illness, injury and old age . Nordenfelt  defines it as ‘the dignity that we attach to ourselves as integrated and autonomous persons, persons with a history and persons with a future with all our relationships to other human beings’ (16, p. 75). Menschenwürde or universal human dignity, is completely different in that it refers to a kind of dignity that as humans we all have just because we are humans . Thus, no individual can be treated with less respect than anybody else with regard to basic human rights. For example, an older patient in hospital should be treated in the same way as younger patients as they have the same basic human rights. Maintaining their dignity while in hospital is of paramount importance to older people  and treating an individual with dignified care may positively influence both their treatment and social outcomes . There is a wealth of research focusing on the older patient’s perspective [17–22] and the family carers’ perspective [23–26] citing respect, privacy, communication and being treated as an individual as important aspects of dignified care. However, they also emphasize the fundamental and vital aspects of care such as eating, nutrition, personal hygiene and toileting [11, 17–22]. Limited in the research literature is the professional perspective on the meaning of dignity and delivering dignity in care and, more specifically, the educational, cultural and organisational factors which enable or hinder its delivery. This is an important oversight as it is the attitudes, skills and behaviour of frontline staff via the development of organisational culture, policies and practice which is critical to the tangible delivery of policy imperatives . Ariño-Blasco, Tadd and Boix-Ferrer  carried out one of the few studies exploring the professional perspective and more specifically a qualitative study with 85 focus groups which involved a total of 424 professionals in six European countries to determine health and social care professionals’ views of various aspects of dignity and older people. Participants were purposefully selected to represent different occupational groups, different levels of experience and seniority and the provision of care in different settings. Participants included medical, nursing, managerial, paramedical and social work professions from a range of settings, including hospital, residential and community. A total of 55 (13%) men and 369 (87%) women took part with a mean age of 41.42 years and their views of what constitutes dignified care were highly consistent: dignified care promotes autonomy, independence, engenders respect, maintains individual identity, encourages involvement, adopts effective communication practices and is person-centred and holistic. Similarly, Baillie  also carried out a qualitative study (case study design) investigating patient dignity in acute hospital settings. Both patients and ward-based staff took part in the study and they identified the following feelings as being central to the meaning of dignity: feeling comfortable, in control and valued, physical presentation and also behaviour. Patients expressed feeling comfortable if they felt safe, happy, relaxed, not worried, did not feel embarrassed and had a sense of wellbeing. A more recent study was carried out by Hall and Høy  exploring the professional perspective and more specifically, 29 Danish nurses’ experiences of caring for older hospital patients. Helping patients regain their dignity was considered to be of central importance to nurses and they reported that dignity was a value that had to do with integrity, respect and worthiness; something the older patients were at risk of losing when being hospitalised. Cairns et al. also carried out a recent survey investigating the meaning and importance of dignified care from a health and social care professional perspective. A total of 192 professionals described the meaning of dignified care in terms of their relationships with patients including: ‘respect’ (47%), ‘being treated as an individual’ (40%), ‘being involved in decision making’ (26%) and ‘privacy’ (24%). ‘Being treated as an individual’ and ‘maintaining privacy’ were ranked as the most important components of dignified care while the physical caring tasks such as ‘helping with washing, dressing and feeding’ were rarely described as being part of dignified care and attributed much less importance than the relational components. While there have been a few studies addressing the challenges faced by health care professionals in delivering quality care to older people [5, 27–32], very few sought to explore professionals’ understanding, conceptualization or definitions of dignity. If dignified care for older people is to be implemented successfully, we need to fully understand not only the patient and family carers’ perspective but also the professionals understanding of dignity in order to develop appropriate and relevant policies and procedures to avoid the breaches of dignity in care of older people. What does dignified care mean for health and social care professionals? Ethical approval for the study was obtained (REC ref number: 10/H0711/49) from both Brunel University and the UK National Research Ethics Service (NRES). Participants for focus groups and interviews were recruited from 4 different NHS sites. Health and social care professionals received information leaflets and reply slips through their ward/ clinical area administrators or managers and were asked to respond to the research team directly should they be interested in either taking part in a focus group or individual interview, or both. Focus groups were arranged on-site (i.e. within the hospital/Trust premises) in a private and convenient place to participants (meeting rooms, seminar rooms or staff rooms). Two researchers were present for each focus group, one to lead the discussion and one to observe and take field notes. Prior to commencing the discussion, the researchers (DK and VW or WM) introduced themselves, explained the tape recording and reiterated that the discussion would remain anonymous. Once consent was received from all participants, the tape recording commenced and one of the researchers started the discussion using an interview guide. Interviews were conducted as one-to-one in depth interviews in a private room within the site premises or at the participant’s home if requested. Once consent was given, the interview commenced using an interview guide. All interviews were audio-recorded with the exception of two participants who requested that the researcher (DK) write notes instead. Both of these interviews were particularly sensitive in that the interviewee had experienced particularly poor practice examples and/or had poor working relations with their colleagues. The purpose of the focus groups was to understand the professional (group) perspectives of dignity in care for older people and the organisational context of each site (i.e. acute, community, mental health). The purpose of the interviews was to explore individual’s experience and perspectives of dignity in care, thus enhancing the large quantitative survey  and focus group data. The qualitative data from the focus groups and interviews together augmented the quantitative contextual information collected as part of the larger project, which has been described elsewhere  providing more detail about the individual and organisational management of dignity within the range of settings. The qualitative data were managed using NVivo10 and analysed thematically. Audio recordings (focus groups and interviews) were reviewed and coded to determine key themes emerging from these data in relation to our research questions (for example, what does dignified care mean to you?). The process of analysis was ongoing and consisted of being immersed in the data and reading through it several times. A bottom-up approach was then used to see which categories and themes arose naturally from the data, rather than having prescribed categories and trying to fit data into these. The process of coding was initially carried out by the research fellow (DK). A sub-set of the interviews and focus groups were also analysed by a second researcher (VW). Finally, all data analysis was discussed and verified/challenged at regular team analytical meetings, thus ensuring group validation of the emerging themes. Each theme or category was verified by searching through the data for comparisons and challenges so that the themes could be refined and all the data accounted for. We anticipated carrying out a total of 13 focus groups and 50 interviews in order to obtain a sufficient breadth and depth of information from across the four trusts. During the process of data collection and analysis we felt that, after 8 focus groups and 48 in-depth interviews, no new information was emerging and therefore saturation had been reached and no further primary data was required. A total of 33 health and social care professionals participated in one of eight focus groups. Focus groups consisted of between 3 and 6 participants. The majority of participants were female (n =30); participants age ranged from 19 – 60 (mean age 40) years and job roles included: nursing role (n =16), occupational therapist (n =7) and mental health practitioner (n =4). The remaining 6 participants included roles included one each of a diverse range of roles (e.g. psychiatrist, psychologist, physiotherapist and social worker). Two of these participants included roles within a mental health trust that are unique and therefore not mentioned to ensure participant anonymity (See Table 1 for full participant profile). A total of 48 health care professionals took part in in-depth interviews. The majority of participants were female (n =45) and their age ranged from 20 – 56 (mean age 41) years. Participant job roles included: nursing role (n =16), occupational therapy role (OTs) (n =19) and managers (n =5). The remaining 8 participants included one each of a diverse range of roles (e.g. clinical psychologist, radiographer and psychiatrist). Four of these participants included roles within their trust that are unique and again not mentioned to ensure patient anonymity (See Table 1 for full participant profile). Five participants took part in both an individual interview and in a focus group. Data collection was carried out between June 2012 and November 2012. In both the interviews and focus groups participants were asked to describe in as much detail as possible and in their own words what dignified care meant to them. The following diagram (see Figure 1) summarises the main themes identified from participant responses. 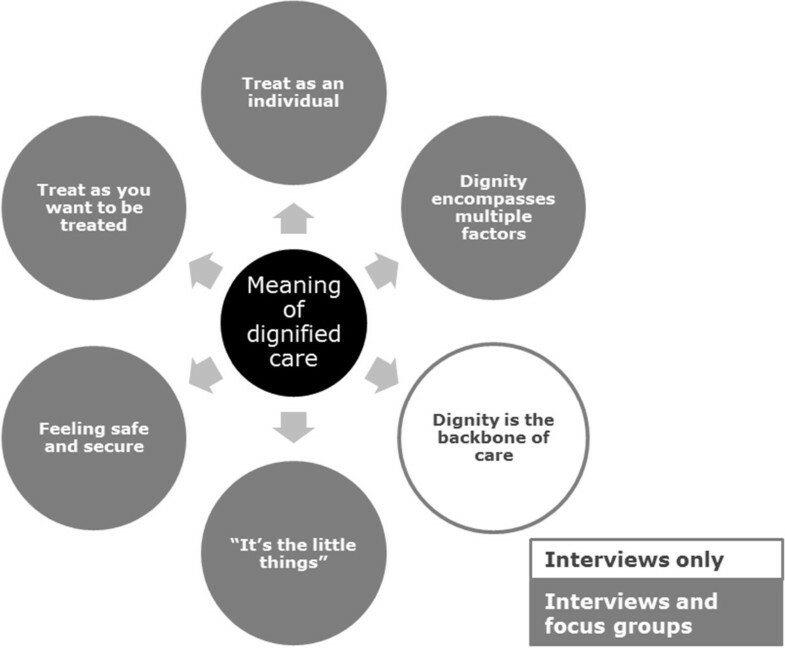 The Meaning of Dignified Care (48 interviews and 8 focus groups). These quotes therefore illustrate the central role which dignity plays in the delivery of care. Dignity was described not only as the ‘backbone of care’ but also as ‘the little things’ that professionals’ carried out in their day to day role. These examples of dignity relate to the relational aspects of care, such as acknowledging patients and involving them in the decision making process, as opposed to direct ‘hands on’ aspects of care such as assisting patients with feeding or going to the toilet. Health and social care staff also provided more specific examples of dignified care which will now be discussed in the remaining sub-headings. Thus, staff felt that the environment, which is again a relational aspect of care, was a key aspect of the meaning of dignified care. If patients felt safe and secure in the environment in which they were being cared for, then they were being treated with dignity. In addition to feeling safe and secure, health and social care staff frequently discussed the importance of treating patients the same way as they would want to be treated or how they would treat a family member. It was not uncommon for participants to describe providing a standard of care to patients that they themselves would expect or want for a family member. While health and social care staff highlighted the importance of treating patients as they would want to be treated, a number of staff also stressed that what they wanted was not necessarily what their patient would want. This is elaborated on in the next theme. Thus, a simple kind gesture, considering the patient’s individual needs, encapsulated the meaning of dignity. It is perhaps then unsurprising why so many different definitions of the meaning of dignified care were provided and clear ambiguities are apparent in relation to the meaning of dignified care from a professional perspective. Our paper presents the perspectives of health and social care professionals on the meaning of dignified care. ‘Dignity is the backbone of care’ , ‘It’s the “little things”’ , ‘Feeling safe and secure’ , ‘Treat as you want to be treated’ , ‘Treat as an individual’ and ‘Dignity encompasses multiple factors’ were the most frequently cited definitions and these closely resonate with dignity guidelines, protocols and definitions that are embedded in national/local policies and which mesh with the expressed views of older people [5, 19–22]. Both the interview and focus group analysis highlighted that ‘Dignity is the backbone of care’. Within this theme participants described dignity as “underpinning” their values as a health care professional and being part of their “code of conduct”. It was within this theme that the more ‘hands on’ aspects of care or ‘basics in care’ were touched on by a few participants in relation to washing and nutrition. However, it must be noted that these examples were the exception as opposed to the norm, as older people and various national reports have emphasised the importance of direct ‘hands on’ aspects of care including eating, nutrition, personal hygiene and toileting as an important component of dignified care [18, 21]. ‘Dignity is the backbone of care’ is perhaps a theme that is unsurprising given dignity appears as a core value in professional codes and human rights declarations. Participants also defined dignified care as “the little things” . Examples included: involving patients in the decision making process (e.g. asking them what they would like to wear); addressing patients in a respectful manner and; acknowledging patients. Again these examples relate to the relational aspects of care. As dignity was often described as a difficult ‘nebulous’ concept, it may be these ‘little things’ that translate into everyday care situations. The ‘big’ conceptual ideas, such as those defined by Nordenfelt, may not be possible to achieve at all times in a busy care environment with a high patient and staff turnover. Participants also considered patients ‘Feeling safe and secure’ as an aspect of dignified care. Ensuring patients felt warm, comfortable and had enough food and water, ensured that they were in a safe and secure environment. Again, while the ‘hands on’ aspects of care such as providing food and water were reported, this was only by two participants. Feeling comfortable and safe were also aspects of care that were central to patients and ward-based staff in a study by Baillie . Both patients and ward-based staff identified the following feelings as being central: feeling comfortable, in control and valued, physical presentation and behavior . Tadd et al. reported that when patients were in an environment in which they did not feel safe or secure, their dignity was compromised. In addition to ‘feeling safe and secure’ in the current study, participants frequently discussed the importance of treating patients the same way as they would want to be treated or how they would treat a family member. While participants highlighted the importance of treating patients as they would want to be treated, a number of staff also stressed that what they wanted was not necessarily what their patient would want. This is elaborated on in the final theme ‘treat as an individual’ whereby participants felt that treating patients as individuals and meeting their individual needs encapsulated the meaning of dignified care. Similar findings were reported in a qualitative study exploring the factors that contributed to stroke patients’ satisfaction with rehabilitation care following a stroke . ‘To be treated with respect and dignity’ was found to be the core factor identified in interviews with older patients. The main factor was sub-divided into five subcategories: being treated with humanity; acknowledged as individuals; having their autonomy respected; having confidence and trust in professionals; dialogue and exchange of information . Finally, ‘Dignity encompasses multiple factors’ captures the various examples that participants provided when defining the meaning of dignity including: respect; being treated as an individual; communication and; privacy. Similar findings were reported by Cairns et al. where participants reported ‘respect’ , ‘being treated as an individual’ , ‘being involved in decision making’ and ‘privacy’ as the most frequently cited definitions. Although the term ‘dignity’ is embedded in many reports and papers, it is rarely defined and has been described as both vague  and elusive . It is therefore unsurprising that multiple examples were provided to describe the meaning of dignified care by participants. The current study findings resonate with dignity guidelines, protocols and definitions that are embedded in national and local policies and which mesh with the expressed views of older people and family carers [5, 16, 19–24]. However, older people, family carers’ and various national reports also emphasize the importance of direct ‘hands on’ aspects of care including eating, nutrition, toileting and personal hygiene as an important component of dignified care [18, 21, 23–26]. However, from both the interviews and focus groups, a combined total of 81 participants, only 5 participants made any reference to ‘hands on’ care. The staff in our study clearly conceptualised dignity as an approach to their role focusing upon ideas of respect, feeling safe and secure, individuality and patient involvement; findings that resonate with the survey findings from this study  and from previous studies looking at the professional perspective [24, 25, 29, 36]. However unlike patients, few of our participants considered the direct ‘hands on’ aspects of care provision such as feeding and toileting as defining dignified care. It is possible that the definitions described by professionals in this study are different from patient perspectives due to the way that policies and debates about dignity are portrayed. In the main they are concerned with attitudes about how care should be delivered rather than how care is delivered. Thus we hypothesize that policy makers and practitioners are ‘taking for granted’ the implicit delivery of care embedded within their roles and see dignity as being concerned with how care is delivered. It is also plausible to suggest that direct ‘hands on’ or fundamental aspects of care are being neglected in staff definitions of dignity because of the specialisation and separation of roles and the emphasis in policy documents on how care is delivered . While the majority of participants in our study were female, this reflects the general NHS health care professional population . With regards to the focus groups, we anticipated a minimum of 5 participants per group. Upon receiving confirmation of at least 5 participants, focus group dates and times were confirmed. However, due to the nature of the professionals being interviewed, a number of issues arose resulting in participants dropping out at the last minute. Reasons included staff shortages, emergencies on the ward and unexpected meetings. On instances where there were fewer than 5 people, participants were invited to be interviewed instead. On four occasions there were fewer than 5 people. However, all participants expressed the wish to go ahead with the focus group as planned. We therefore felt that is was important to continue with the focus groups to enable those who had attended the opportunity to discuss their experiences of dignified care. While our intention was to interview and conduct focus groups with both health and social care professionals, only one social worker took part in a focus group and no social care professionals came forward to be interviewed. Our study highlights the differences between staff, patient and family carers’ expectations as to what constitutes dignified care. Furthermore the lack of meaning attributed to the vital and fundamental aspects of ‘hands on’ care suggests that policies around providing dignified care are being interpreted as an approach towards care and not with direct care provision. As previously proposed  this limited interpretation of dignity may be one factor contributing to the continued neglect of older people in acute settings. Policy makers, NHS organisations, managers, medical doctors, nurses and health and social care professionals more generally, equally have a duty of care to address the vital aspects of dignified care. Thus, proactive measures are required in order to support and encourage health and social care professionals. One possible suggestion is ward leadership, where health and social care professionals are directed and supported in addressing and providing not only relational aspects of care but also direct ‘hands on care’ such as eating, nutrition, personal hygiene and toileting. Identifying the facilitators and barriers to delivering dignified care will add richness to these findings and help us better understand why direct ‘hands on’ aspects of care are considered with less importance . Ethical approval for the study was obtained (REC ref number: 10/H0711/49) from both Brunel University and the UK National Research Ethics Service (NRES). We wish to acknowledge our collaborators and team members of the Dignity in Care project: Professor David Oliver, Professor Andree le May, Dr Sally Richards, Dr Wendy Martin and also to the staff who made time to participate in the focus groups and interviews. This work was supported by The Dunhill Medical Trust [grant number: R93/1108]. DK carried out the data collection and analysis and drafted the manuscript. CV is the Chief Investigator on the project and made substantial contributions to the conception and design of the study and helped to draft and review the manuscript. VW contributed to the conception, design and analysis of the study and helped to draft and review the manuscript. All authors read and approved the final manuscript.